How's it going for you this November? I hope everyone is fine and dandy and enjoying each day despite the unpredictable weather we're having here. Hello everyone! I am Mei Ling (a.k.a. Unazukin by many who scrap), an active (always busy with something) craft lover from young, who dabble from origami, quilling to stamping and anything else that is related to craft. Among all, scrapbooking is most enjoyed as it embellished precious memoriesat the same time, I get an enormous sense of joy to see my thoughts and ideas being translated into physical layouts. I love my craft works to be colourful and fun. I consciously challenge myself to do something different from what I've done. When I received Ed's email, I was taking stock of my stash and creatively thinking how to pack more things into a confined space (sounds familiar, doesn't it :> ). And I chanced upon an old photo album where the pages looked like a layout, yet its very minimum. 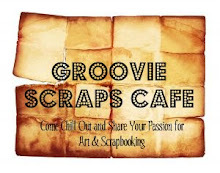 I am glad to have known friends and challenges (super effective to de-stash) from Groovie Scraps Cafe and I am definitely excited and honoured to be Featured Groovie Guest Designer for November. Ed, thanks for the invite! We've got a RAK Prize for a Winner!